A tranquil oasis in the Maldives, LUX* South Ari Atoll is designed to enhance its magical island surrounds. With 187 spacious pavilions and villas, either above water or on land, LUX* South Ari Atoll is a luxury haven for the whole family. Situated on the picturesque island of Dhidhoofinolhu, LUX* South Ari Atoll is the only resort on the island, and its location can’t get any better. Crystal blue waters and lush gardens, the resort perfectly compliments it natural surrounds. An idyllic private island means more privacy and a much more intimate resort experience. While there are 187 pavilions and villas, with an entire island to share, it feels like its just you in your own island paradise. Each of the 187 pavilions and villas provides a new level of elegant luxury. Comprising of 36 Beach Pavilions, 6 Family Lagoon Pavilions, 45 Beach Villas, 12 Beach Pool Villas, 38 Water Villas, 46 Romantic Pool Water Villas, 3 Temptation Pool Water Vilas and 1 LUX* Vila. 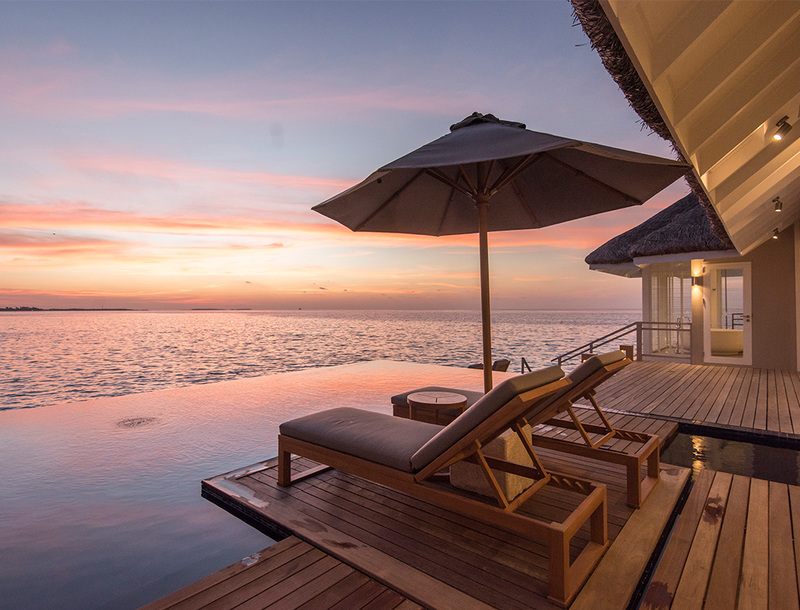 Sophisticated and simple, they all offer spectacular sunset views over the glistening lagoon. Spread across both sides of the island; The Beach Pavilions, Beach Villas and Beach Pool Villas all have their own private terrace and offer direct beach access. Furthermore, with en suite facilities and luxury amenities, the LUX* beach accommodation offers absolute luxury for couples and families. The Romantic Pool Water Villas and Temptation Pool Water Villas are located just off the South East coast of the island; each offer gorgeous sunrise views and each feature a luxurious plunge pool and a 14 metre long private pool respectively. Each of the Temptation Pool Water Villas also features a separate living area with a glass floor as well as a luxury Jacuzzi. The Water Villas are on the North West coast of the island and provide direct lagoon access as well as all the amenities and facilities of the beach pavilions. Offering uninterrupted views of the lagoon and the island surrounds; the luxuriously spacious LUX* Villa can accommodate up to 2 adults and 1 child. Ideally suites for couples, the Villa features panoramic windows, a glass floored living and dining room, a spacious outdoor terrace and lounge area and a private infinity pool. The Senses restaurant offers guests Middle Eastern flavours with a hint of Indian Ocean cuisine. There’s also a Senses Bar and Lounge offering cocktails and other beverages as well as Sri Lankan teas in the afternoon. Furthermore, if you’re feeling hungry they also serve light local cuisine lunches if you want something to eat in a less formal setting. Umami is a modern Japanese restaurant delivering exceptional sashimi, nigri and maki; as well as the entertaining dining experience: teppanyaki. MIXE gives guests an authentic beach experience with dining under thatched roofs and a soft white sand floor. It’s the place for buffet breakfasts and dinners, offering innovative international cuisine. With live cooking stations offering everything from wood-fired pizzas and grills to delectable stir-fries with an island twist. Evenings at MIXE are a highlight with local performers every night. An over the water restaurant offering Asian inspired foods cooked right in front of you providing that “market” feel, East Market tingles the tastebuds with dishes from South East Asia. In the mornings, if you’re feeling like something European, look no further than the glass-fronted oven, where croissants, pastries and baguettes are freshly baked each morning just for you. Located in the same vicinity as East Market, the unique East Bar boasts swinging double seats as well as loungers on catamaran nets floating above the alluring Indian Ocean waters. A beachside bar offering delicious burgers and drinks; perfect for a relaxed afternoon. Sit back, relax and enjoy the views and the reggae vibes of this social hangout space. Delivering world-class authentic Italian and southern European cuisine, Allegria delights guests with a sophisticated dining experience. Authentic dishes and cheeses coupled perfectly with local Scrucap wines as well as Italian, French and New World labels. Enjoy the relaxed nature of Beach Rouge; devour classic thin crust wood fired pizzas made fresh to order and an array of cocktails while feeling the sand between your toes and watching the sun set. Freshly ground coffee beans, roasted on site, deliver guests some of the best coffee in the world. Forget instant coffee; here you’ll be drinking the finest barista made coffee each ad every day. Next to the gorgeous infinity swimming pool, take a second to relax and enjoy a drink during the day while you soak up the sun and enjoy your island paradise. At LUX* South Ari Atoll, you’ll never run out of things to keep you entertained; whether you’re an adrenalin junkie or just want to relax, LUX* has you covered. A personalised approach to wellbeing, LUX* Me delivers treatments and facilities tailored to you. Everything from a spa, fitness centre, yoga, meditation and nutrition, LUX* Me has you covered. On a private island, its not surprising there’s a range of water sports on offer. Complimentary activities include canoeing, pedal boating, kayaking, and snorkelling trips to the house reef. Optional activities at an extra cost include diving, windsurfing, fun tube rides, water-skiing, jet-skiing, kite surfing, catamaran trips, whale shark safaris, fly boarding, glass bottom boat excursions, private trips with speedboat or dhoni, as well as morning and sunset fishing. If you don’t feel like heading out to the water; there’s tennis courts, a table tennis table, billiards and more to keep you entertained. Furthermore, you can hire bikes to explore the island. LUX* South Ari Atoll is perfect for families with a range of activities on offer for kids and teens. PLAY offers kids between 3 and 12 heaps of activities allowing them to explore the island and learn about the nature and culture of the island and its surrounds. Furthermore, kids are treated to a wide range of sports and outdoor activities. Studio 17 is for 12 to 17 year olds; providing a place where they can hangout and explore the island together. With a range of activities including local dance and language classes, beach sports activities and exciting adventure trips around the island; their Maldives holiday just got even better.